Look up the most popular and amazing day hikes in both the United States and especially the National Parks and I believe there’s one large omission from a lot of those lists. The Rim to Rim Grand Canyon Hike and/or the South Rim to the bottom of Grand Canyon National Park via the Bright Angel Trail. 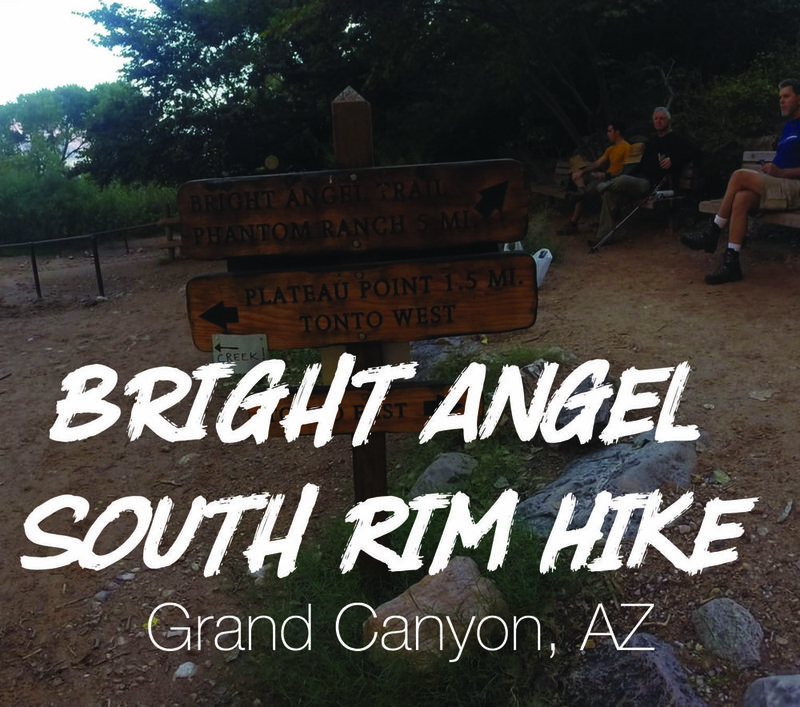 The Rim to Rim is on my list do hike in 2018 and a large part of that was due to my amazement and love of the South Rim’s 9.3 mile trek to the bottom on the Bright Angel Trailhead that I had the opportunity to do. My friends Greg, Matt, and I were heading down the Colorado River for a week with the kind and experienced folks from Grand Canyon White Water. If you ever take a river trip I highly recommend utilizing them! To get to the raft and the river though on the trip that we were taking it required a 10 mile journey from our lodge that we stayed at on the South Rim the night before. You might think a 10 mile hike that LOSES 4,380 feet with a pretty consistent 10% decline the entire way wouldn’t require much training…that is wrong! The first thing I want to say about this hike is that you should be in shape and be a regular hiker! There were a few folks who weren’t in shape and they massively struggled with the hike and said if they didn’t have a week of relaxation at the bottom or the alternative of heading back UP they would have quit given the opportunity! We met Grand Canyon White Water at 5am to begin our descent. There is nothing like seeing the Sunrise as you head down the Grand Canyon. There’s an alternative trail from the South Rim via the Kaibab Trail that is only 6.8 miles but is much more sloped and has no offering of WATER or SHADE. This is a TOP TEN Day Hike in the United States National Parks system in my opinion. Get it on your list as soon as possible if you are an avid hiker. There’s an overnight camping option or a stay at Phantom Ranch but make sure you get your reservations early! Bring your HIKING POLES and WATER. And lots of that H2O. The hiking poles will help your knees out more than you could ever imagine. I grabbed awesome trekking poles from REI specifically for this hike and I have been using them ever since. We did the hike in about 3.5 hours but we were moving. Typically allot 4-6 hours to get to the bottom of the Canyon. What makes this hike so great? You are hiking down to the bottom of one of the wildest and craziest pieces of land on the entire Planet! The excitement and energy from fellow hikers is hard to find on other trails. When you come to the Grand Canyon people are STOKED that they are at the Grand Canyon. You also find large groups heading to or from the river from an experience of a lifetime by going on a rafting trip. Wildlife is pretty good, the cacti are beautiful, and once you hit about 6 miles in or so the Canyon opens up that my buddy described as beautiful as high altitude trekking in Peru he did en route to Macchu Picchu. You get to be proven wrong that hiking down is not hard and isn't a workout. I even thought it. What waits for you at the bottom might be a bigger treat than anything but a bucket list mountain summit. The Colorado River is truly a gem and so important to the existence of the Southwest region of the United States that you can’t help but be in awe of it. It depends on what you are doing. Trekking poles, snacks, and a copious amount of water (SERIOUSLY people have been helicoptered out, lost, and unfortunately died inside of the canyon. It’s a hot and dangerous place if you don’t respect it.) are MUST’s but whether you are hiking to the North Rim, staying at Phantom Ranch, heading back up to the top of the South Rim, or hitting the Colorado River on a rafting trip will determine what else you need! What’s my favorite memory of this hike? Trevor and Brock did the 4 miles up and 4 miles back in flip flops! Hilarious and 100% true. What about your trip down the Colorado River on the raft? That’s another post (or a series of posts) for a time that is coming up soon. This blog was all about the hike to the bottom of the Grand Canyon. More on the next six days of the trip very soon! Here's a little sneak peek pic! Have you been to the Grand Canyon? Have you done this hike before? Any questions or additional thoughts? Put your comments below we’d love to hear them. Thanks for being part of the Hashtag 59 community. All travel is awesome and adventure can be found anywhere. Keep your eyes open and ears unplugged. Sign up for our newsletter below and drop us a line HERE!